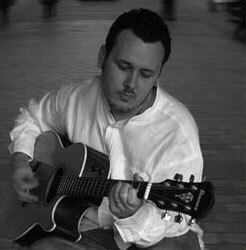 Tom Frankson is a talented acoustic artist, originally from the French-speaking Caribbean island, Guadeloupe, and now living in Villiers Sur Marne, France. Although he is now moving more towards writing songs in his native language, his current work is in English. I’ve always had a soft spot for acoustic artists. I also have a soft spot for the French. So, it’s no surprise that Tom’s music resonates so well with me. There’s a sing-able quality that’s hard to resist, and since there’s almost no detectable accent when he sings, you’ll barely notice he’s not a local. Something about listening to Tom’s work reminds me of sitting back in my college lounge, watching Howie Day perform several years ago. He carries the same emotional and vocal command, and brings you a very down-to-earth comfortable sound, that you’d be hard-pressed not to be able to relate to. AX: When did you start performing? years old, and I was playing guitar and singing. But it didn’t last; 2 years, I think. AX: Do you primarily work solo projects, or have you worked with bands also? song with my computer, I can do whatever I want, with no restrictions. Of course, there’s not the band power, but it’s a choice. an interest in making music your full-time career? Tom: I always wanted to become a full-time musician, and it’s still true, but now, with time, I realized how hard it is to do. Sometimes, I send some music to majors or professionals, but I have a big problem here in France. I’ve always sung in English, and here in France… that’s a big problem, so I have to work on it. AX: What originally made you gain an interest in music? and I always loved singing. My father was playing guitar, so one day, I took one and worked all night long. In the morning, I was playing The Beatles’ “Rocky Raccoon”, and never stopped working this instrument. AX: What do you hope people are able to take from your music when they listen to you? music; I don’t fight against anything, don’t have lessons to give… Most of the time, my music is a picture of a moment or a feeling. Sometimes, it talks about a dream I had, sometimes it’s just a story… I just hope people will feel it. AX: What made you choose to record in English, rather than French? English. But it’s really harder, because English is a singing language. French can be too, but words are harder to find, so sometimes, it can be ridiculous… It’s really a [lot of] work. AX: What do you think are some of the biggest differences in trying to make it in the music business between the US and France and other parts of Europe? You can find out more about Tom Frankson, or listen to his recordings, at www.tomfrankson.com. The site is in French, but you can translate it to English by clicking HERE.